UPDATE 4: Just remember, Democrats. There are a whole hell of a lot of single issue, 2nd amendment voters. 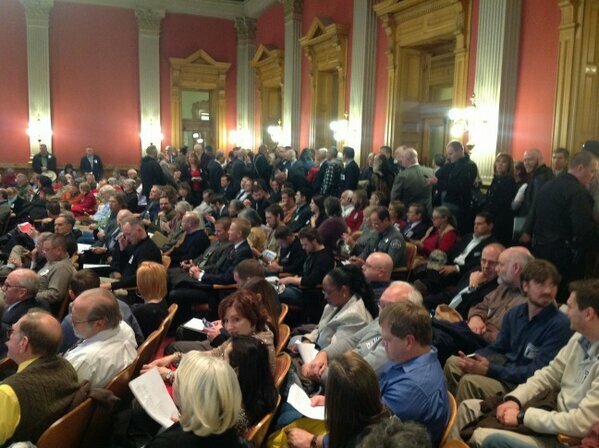 UPDATE: The Colorado House Democrats, likely at the urging of Speaker Mark Ferrandino, start the gun grab hearing by restricting public testimony to 2 minutes each. We don’t remember civil unions testimony being that restricted. The gun grab attempt by legislative Democrats begins today. Well, not if supporters of the 2nd Amendment have anything to say about it. What could be an all-day battle over gun-control bills is expected to play out in a Colorado House committee on Tuesday. The House Judiciary Committee is expected to hear both bills, one of which would call for universal background checks on gun transfers and the other which would limit high-capacity gun magazines, upon adjournment of the House in the Old Supreme Court Chambers of the state Capitol. As Hoover reported from the Capitol this morning, the grassroots energy is clearly on one side of this issue. Courtesy of the House GOP, proof positive that Democrats have underestimated the passion of gun rights supporters, despite Bill Clinton’s warning. David you seem to be the ignorant person here. The 2nd amendment makes no mention of muskets. To keep and bear arms… doesn't say muskets. To Keep and Bear arms so people can defend themselves. I prefer to be able to defend my self and my family, waiting for the police = being a victim and I refuse to be a victim. If you want to be a victim or a subject of the government then that is your choice but many of us choose differently. Shawn Rosvold, what's wrong when despots register guns with the pretext of "universal background checks"? You're so naive why this is being pushed– read your history because it's just repeating itself– and bungling fools like you never learn it's bitter lessons! I see some really sane ones being proposed too. You keep saying "no one wants to take your guns!" yet bills are being proposed that run the gamut from banning hunting ammunition to one bullet per gun to outright confiscation. Look it up! You know nothing but what CNN tells you because this isn't your rights we are talking about because it is obviously something you don't care about. If you investigate you will will see insane bills being floated all over the country. There are 22,000 laws on the books — some sane , some stupid — how about we enforce those. I love hearing how background checks should be more strict from people who have no basis for comparison. The truth is that they are already pretty damned strict. You can have a squeaky clean record and be turned down for a purchase- happens all the time. Ask any FFL dealer. When it does happen you have to fill out a form challenging the denial then wait 30 days for the govt. to admit they made a boo-boo or that someone was having a bad day and arbitraily denied it. Then after 30 days you can get a 'conditional proceed' which means you can finally have the gun but that it still isn't legally yours until they have double and triple checked to make sure your not a criminal. On top of this we are now supposed to register our weapons so that if the law gets changed and they suddenly have too many bullets or are of the wrong make and model later on down the road they can be easily confiscated? I invite anyone that thinks background checks are not 'strict' enough to go to any gun shop in America and do a background check and try to buy one yourself before deciding that they are not strict enough. In fact this is being presented by the media in such a way as to make it sound as if we don't already have very strict background checks. It is a gross misrepresentation and an outright lie. Your a moron, read history they could also own cannons which were the equal to a tank in those days. You are a moron. This is how it got started in California.. look at what a safe and law abiding state that is…crime reports tell the story, don't buy the lie.. gun control does not save lives or make anyone safer except criminals. we need to organize a recall election now. This is our state and they are not representing us. Shawn, just list one sane gun law. How will you know if you get what you want? Shawn Rosvold It's stupid and how's it going to be managed, None of this can take place without complete listing of all weapons, Unconstitutional and epecially with government agencies nothing but screwed up. Do you know what a background check even does?? 80% of america doesn't. Laughner shooter in tucson passed, aurora shooter passed, langza didn't boter, did nothing for columbine, now tell us WHY we should. Shawn, perhaps you would care to explain the legislation being proposed by the democrats in Missouri? Or Ms. Fienstien's comments regarding confiscating ALL firearms. Anyone paying attention has noticed that the demcrats agenda is to disarm the American civil population. I'm sorry the word "MUSKET" must be in the very fine, fine print in 2nd amendment. I missed the fact it was only covering MUSKETS! If you want sane gun laws, the propose sane gun laws. Not the useless dog's vomit that's the majority of bills proposed up in the State House right now. Wendy Dave Selvig – It's called universal background checks. If grandpa wants to hand down his legal weapon to anybody, they will need to pass a background check. What's wrong with that? Julius Henry Please. What a lame (pardon the pun) argument. Nobody wants to take your damn guns. We want sane gun laws. That's all. A semi-automatic firearm, is a weapon that CAN be applied with discretion to eliminate only the specific threats to my safety. A Bomb, booby trap, or Nuke…cannot. So it's a false argument. For the thousands of Disabled Coloradans , that cannot reload a gun or swap a magazine in a few seconds like an able-bodied person, this bill directly compromises their RIGHT to defend themselves. Many of those lost a limb or the use of a limb fighting FOR these very rights, you would deny them. Likewise for some, a pistol grip or a fore grip is the ONLY way the can effectively exercise their right to defend themselves. You and these 7 Dems disgust me, government is FOR protecting the most vulnerable in our society not for putting them at greater risk. David Stapelkamp-Lane why don't you come down to earth, sit with me and have a rational conversation? All you have done is be childish here.. FYI I'm not ginger.. never have been. As for me moving to Alabama, na I like Colorado, born and raised here. Try being civil when speaking to folks and you might get somewhere, instead of the childish stuff you've done in the last 20 mins..
David Stapelkamp-Lane wow, thats a very intelligent statement calling me stupid. Oddly enough I'm not a gun nut.. My wife and I own exactly 4 firearms…I don't have thousands of rounds of ammo, I don't spend everyday at the range, this isn't about guns.. Its about protecting the Constitution of the United States. The freedoms you enjoy at a citizen of this country. Freedoms that hundreds of thousands have died to protect. And frankly if you agree even the smallest bit with breaking or change that document, you don't deserve the protections it provides. If protecting fighting for freedom and YOUR rights makes me a gun nut then so be it. Hand me that label and move on..
Why don't you move to Alabama? David. Please don't try to play that. I can give you a rebuttal. Do I think I need a F16? Nope, can I buy one? YUP..Do I need a tank? Nope can I buy one? YUP. Do I want a tank YUP, Can I legally buy an armored personal carrier? YEP, They ARE legal to buy with proper permits… Do I want a Nuke?, your now just being silly. Why would I want or need a Nuke that would put all that I hold dear in danger as they are BY NATURE unstable. A gun, or a mag are NOT by nature unstable. They don't go off killing on their own. I.E a Nuke CAN. Do I personally NEED a 100 round mag? nope don't even own one.. Why? PERSONAL CHOICE, something that is guaranteed by our constitution. Your Comparison is apples to hand grenades. Do I own an AR-15 no, why? can't afford one.. If they were cheaper would I buy one, YUP.. Why? they are easier for women to fire, and are darn fun to shoot at the range. Does the public need 30 round mags? YES.. for protection from criminals, for competition shooting, For MANY reasons. The real question is..Why are you for control of guns and mags? When the question that hasn't been addressed is WHY these killers that do these horrible acts do them? Mental issues? some other reason? that's the REAL problem here, and nobody wants to face it.. The gun is just a tool, it is NOT in fact the cause..
Neener. Neener. Privacy settings are hard. Nice goatee, ginger. NEEEEEEEEEENER. Idiot. Letting people comment on your page is the epitome of dumb, don't you find? BUT YOU REALLY KNOW ABOUT YOUR GUN RIGHTS, DON'T Y OU!!!! And, like most gun nuts, I wouldn't trust you with an automatic weapon within miles of my family. Because you seem flat-out stupid. Because after reading your comments, I'd rather they be limited to people who have the training and authority to use them. And, frankly, not you. Ryan, I saw your comment on 9News. Why do you think you should have unlimited access to deadly weapons? I mean, even the Supreme Court ruled that the second amendment had limits in a civil society. Do you honestly think people are after your guns? Do you realize that the words contained in the second amendment did not take into account anything other than a musket? I mean, really. Should you be allowed access to a nuclear weapon and bunker buster bombs? Any one supporting these bills needs to be met with a petition to hold a recall election and clear the house and senate. Make it very clear supporting these bills will cost you your seat. Actually we should do this anyway because obviously these jack wagons don't represent us. HB13-1229, sponsored by state Representatives Rhonda Fields and Beth McCann (D-8), would prohibit and criminalize the private transfer of firearms. That means grandpa can't hand down his rifle to grandson. Where do these guns go when we die? To the government? And then after a generation or two die out, there are no guns left and the dictatorship can come in and force anyone to do or go wherever they seem fit for the community. This is sooooo dangerous. They could literally line people up and put them in gas chambers…of course THAT'S never been done before now has it? All members of our state congress need to remember one thing.. We vote them in, and we can vote them out.. I'd bet that unless they drop these ridiculous Anti-gun bills, they won't be re-elected. I agree with Michelle Glanville.. Anything BUT total support of our 2nd Amendment in treason! Many thanks to all those able to attend!